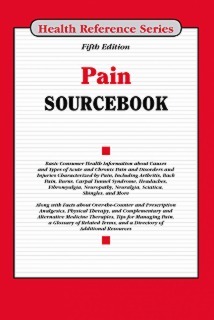 Pain Sourcebook, Fifth Edition provides updated information about the many ways people encounter pain and the steps they can take to avoid it. It explains the different ways people experience pain and how pain affects mental health, sleep patterns, and everyday tasks. Details about the causes and treatments of the most common types of musculoskeletal pain—including arthritis and back pain—and many other pain-related injuries and disorders, such as burns, headaches, neuropathy, and postoperative pain, are included. A section on pain management offers tips for working with a healthcare provider or pain management team, facts about diagnostic procedures, and information about the most commonly used conventional and CAM therapies for pain relief. The book concludes with a glossary and a directory of resources for additional help and information. It includes access Health Reference Series Online. Part I: Encountering and Avoiding Pain examines the phenomenon of pain, the various ways people experience it, facts, theory and types of pain. It also provides an insight into the differences in pain perception among specific subpopulations. It offers strategies for coping with chronic pain and provides tips for avoiding pain. Part II: Musculoskeletal Pain describes what is known about disorders and injuries that can cause pain in the joints, tendons, ligaments, bones, and muscles. Individual chapters examine the most common acute and chronic conditions associated with musculoskeletal pain, including arthritis and other rheumatic disorders, back and neck pain, bone pain, fibromyalgia, knee pain, muscle pain, neck pain, repetitive motion disorders, shoulder pain, sprains, strains, and sports injuries. Part III: Other Pain-Related Injuries and Disorders provides information about conditions of the body’s organs, systems, and tissues where pain is the primary symptom or a common complication. These include complaints defined by pain—such as gynecological pain, headaches, chronic pelvic pain, and somatoform pain disorder—and a wide variety of diseases associated with pain, such as burns, cancer, heart disease, appendicitis, sickle cell anemia, and sinusitis. Painful injuries and wounds to the body, such as burns, amputations, and surgical incisions are also discussed. Part IV: Medical Management of Pain offers tips about effectively communicating pain-related symptoms to a healthcare provider, and it describes the tools that are used to diagnose the sources of acute and chronic pain. It recounts various approaches to pain management and discusses the benefits and risks associated with some of the most commonly used pain relievers. Invasive, implanted, and surgical interventions are also addressed, and the part concludes with information about palliative care. Part V: Additional Help and Information includes a glossary of terms related to pain and pain management and a directory of resources for readers seeking more details or assistance.